Ukrainian government troops are being outgunned by pro-Russian rebels because they lack new anti-tank weapons and radars, a military expert says. Modern heavy armour gave the rebels the advantage in fighting at Donetsk airport recently, Reuben Johnson of Jane's Defence told the BBC. Ukraine has asked the US for Javelin anti-tank missiles and hi-tech radar that locates heavy artillery, he said. 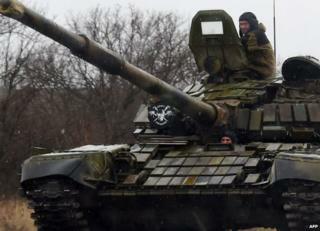 Washington is considering whether to supply Ukraine with defensive weapons. So far the US has not delivered arms that can match Russian equipment. Nato, Western governments and the Ukrainian government say Russian regular troops are fighting alongside the rebels, using new heavy armour and artillery. Russia denies that, but says Russian "volunteers" have joined the rebels. "The Russian equipment in eastern Ukraine is some of the best they have," said Mr Johnson, based in the Ukrainian capital Kiev. "About 70% of Ukrainian anti-tank missiles are old or even expired. But almost all the Russian armour is reactive - that means boxes of explosives cover the tank, so when a missile hits a box it blows up the missile without harming the tank." Last year Ukraine asked the US for counter-battery radars, which can show the path of incoming projectiles, he said. Such tracking radars enable troops to pinpoint an artillery or mortar unit, which can then be targeted. "They got counter-mortar radar - but its range is shorter, and it didn't work," Mr Johnson said. Counter-artillery radar was not supplied apparently because the US government feared that Ukraine might then target artillery pieces firing from Russian soil, he said. The rebels control a big swathe of Donetsk and Luhansk regions - known as "Donbas" - bordering on Russia. The conflict erupted last April, when the rebels seized government buildings in Donbas, shortly after Russia had annexed Ukraine's Crimea peninsula. A group of US think-tanks has given estimates of the troop strengths in the combat zone, in a new report. It is based on recent discussions with Nato and Ukrainian officials. The report quotes Ukrainian sources as saying "the total number of Russian troops and separatist fighters in the Donbas came to 36,000, as opposed to 34,000 Ukrainian troops along the line of contact. "They believed that Russian forces made up 8,500 to 10,000 of the 36,000." However, the report also notes that Nato gives a very different assessment of Russian troop numbers in Donbas. Nato estimates that up to 1,000 GRU personnel (Russian military intelligence) and Russian officers are helping the rebels, according to the report. But Nato says the troops have not been operating as organised Russian army units. These estimates contrast with those of a Russian military analyst, Ilya Kramnik, who said last September that Ukrainian troops outnumbered the rebels two-to-one. He gave the figures as 20,000 to 25,000 on the rebel side, against 45,000 to 50,000 Ukrainian troops.